Well, I still use free banner impressions with it, so it's still not a big deal.. Even if it does get me a single sale it will still be pure profit from free banner impressions that my site accumulates.. So it will just be conversion of traffic to cash for me. That's sort of what I'm thinking. If you have the traffic and you don't have anything better to put in there then maybe throw the banner up because if it does hit it is money for you. 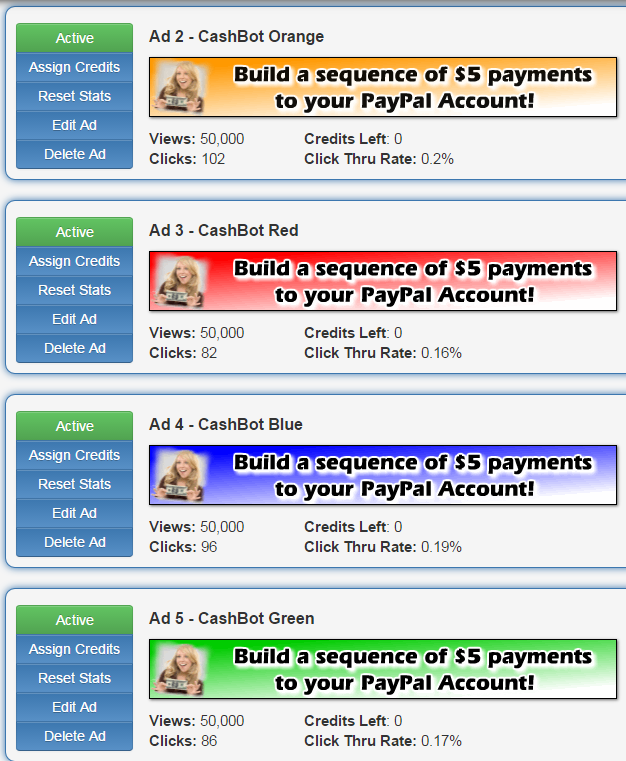 After 80.000 out of 200.000 impressions received on BoB, I got a new sale on CashBot! I decided to hold on with TrafficG until I have 200.000 impressions ready to distribute equally to all banners so I didn't run a campaign there! And since I have no running campaigns on PV and my banner on my ads page has not received clicks any time close to the sale time , so my best guess is that out of 130 clicks on my banners from the BoB network, one caused the sale to happen. It has been going nicely so far considering that I'm promoting the program with free banner impressions. The banners will now receive another 120.000 impressions from BoB and 200.000 impressions from TrafficG (I'll run that campaign after the BoB one ends for better tracking purposes). And I also have some free credits on GetRef waiting to be used up.. not to mention BEMs..
As a summary I have 3 records of sales including Rui's one. Btw, I figured out how to search for your sales in your email account..
"notification of payment received"+"[your cashbot id]"
My BoB campaign is still running having few (<10.000) credits left but yesterday I got another sale totaling 4! I still haven't run the Traffic-G campaign and I'm ready to run that as well with another 200.000 banner impressions when the BoB expires. All in all it's been going rather well for something that has a paid-only membership standard and is promoted for free through banner exchange! Now it's time to fire up the Traffic-G one with another pack of 200.000 banner impressions 50.000 on each banner. Let's see how that one goes. You're just missing pink and black and then you have a whole ranger team. And there should be one combining all colors maybe switching through them.. like combining all powers in one! He's gonna bring polution down to zero! Well.. basically you've given me the idea of making the banner change colors over time, like once a second or sth or gradually maybe..
Maybe I'll try it out when I'm ready for my next campaign..
Btw, the orange banner won the click conversion prize in both campaigns! Looks like the fun is over with cashbot.ca.. It seems to be permanently on a temporary maintenance.. and in the "meantime" it's promoting something else as well.. I suggest that you avoid programs like this in the future. Just saying. In the future, you could either promote DonkeyMails' or No-Minimum's PTP in TrafficG and earn a little money with it. Or you could even convert the credits to banner impressions and then promote the BoB exchanger there to earn more BoB credits. At $5, it was far from the worst money burn I've made so far. Very, very far. Ok, but generally speaking, if a program is too much about making money and doesn't have enough substance to it, it's usually a red flag itself. IMHO. they are most likely connected to cashbot.ca which scammed a bunch of people not long ago.. The reason I'm saying this is because the cashbot domain redirects to the commhubb homepage without even using a referral link. Why would a site owner do so, if he doesn't own the other site as well? and last but not least their plan is to build a new web and offer free internet to everyone with funding they get from advertisers..
For all these reasons, I believe CommHubb is a fresh scam at first site, so I just posted here in order for google searching people to know.